Let the Prescott Adventure Begin! My Arizona adopted Mom, Cynthia, and I love to take shopping jaunts, coupled with lunch. On a warm summer day, we decided to go to slightly higher elevation to find a dash of cooler air. So, down to Prescott we ventured. On the way down, we decided that we needed to take care of first things first, lunch. I had already picked out the eatery, a small café called “The Local”, which serves only breakfast and lunch. 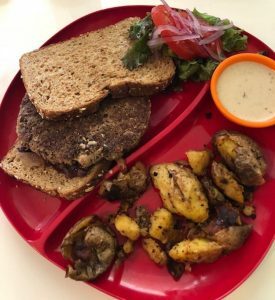 While not vegetarian nor vegan specific, they do have a vegan menu that you can request. And they are definitely willing to modify other menu items to fit the bill. After my aversion to the Beyond Meat Burger (check out my 7/24/18 blog), I was mighty skeptical but definitely willing to approach this new kid on the block (currently not available for retail purchase, only available at restaurants), The Impossible Burger, which is one of their vegan menu selections. 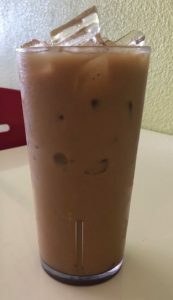 Deviating from my typical beverage of choice, unsweetened iced tea, I opted for adventure with their Iced Almond Milk Horchata. It was slightly less than moderately sweet, perfect for me. Refreshing and the ideal accompaniment for what was about to come. Now, I have to say, that they have several enticing salads and sandwiches. Oh, and they serve breakfast all day, with blueberry spelt pancakes served with fresh fruit; tepa chorizo hash served with roasted vegetables served with a corn or flour tortilla; a hot cereal blend of wheatberries, barley, quinoa, almonds, cranberries, and almond milk served with mango and/or pitaya puree; plus an acai bowl with house-made granola, blueberries, coconut, and bananas. 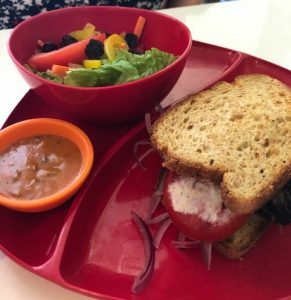 Cynthia opted for their Portobello sandwich on a swap-out of gluten-free bread (which was amazingly moist and tasty) with a side salad. All sounded incredible, but I was not to be lead astray. I went for the Impossible Burger; and so it was. However, next trip back to Prescott will almost assuredly include breakfast all day at The Local. It was served on Dave’s Killer Bread with lettuce, tomato, and pickled onions. For my side, I opted for their Yukon Gold smashers based upon our server’s recommendations. Now, let’s get this straight out of the way. The Local is not going to win any prizes for their plating, as I’m sure you probably already thought looking at the plated photos. Please don’t let that distract from the point at hand…Would I, or would I not, become a fan of the Impossible Burger. Upon my first bite, I was hooked. The burger held together and was quite textural, in a good way. Exactly what I was hoping for, without one very important aspect. It didn’t have the exact reminiscence of a beef hamburger that caused me such aversion to the Beyond Meat burger. I was, to say the least, in burger heaven! 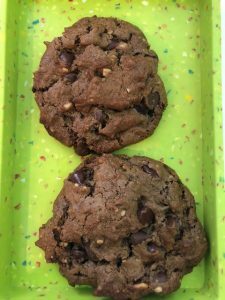 We rounded out our lunch with double chocolate peanut butter gluten-free cookies that they make homemade there. They were astounding. If they hadn’t mentioned that they were gluten-free, I would not have known the difference. The perfect ending to a stellar lunch with an amazing friend. Full and sated bellies, off we went to roam about some of our favorites stores.